The first 50 years of North Park come to life in our award-winning coffee table book, North Park: A San Diego Urban Village, 1896-1946. Written by the late Donald Covington and based on research begun in 1988, the manuscript was organized/edited by Karon Covington and Katherine Hon and published in 2007. 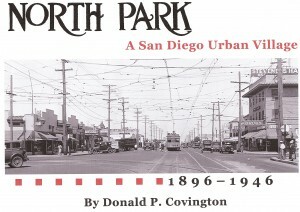 The North Park Historical Society received an Award for Excellence in Historic Preservation from the City of San Diego Historical Resources Board on May 22, 2008 for publication of the book. Click here to see the award. Click here to see the Special Commendation from Councilmember Toni Atkins.The suggested retail price is $22.95 plus tax. Sales benefit the North Park Historical Society.